We get many queries about our faux bouquets that we style for our photo shoots. 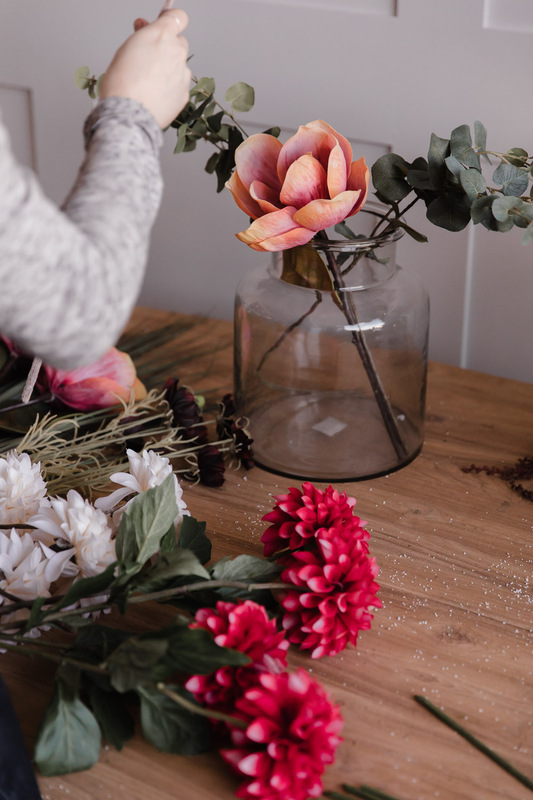 At the moment, we don’t sell bouquets online (although, keep your eyes peeled around upcoming special occasions, like Mother’s Day and Christmas) but we usually have a few ready-made bouquets placed around the showroom and can help you to create your own faux bouquet if you pop by. 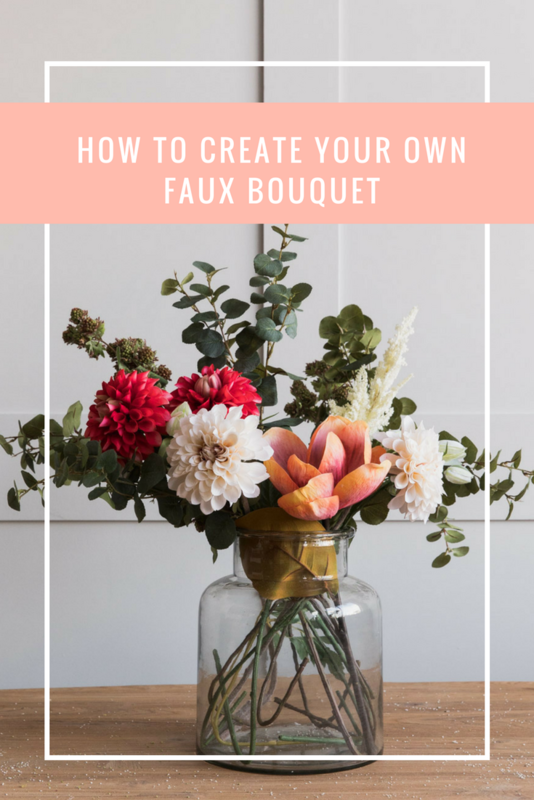 If you’re looking at our faux flowers online and are unsure where to start when it comes to creating your own faux bouquet, our stylist, Emma, has compiled a simple guide to help. 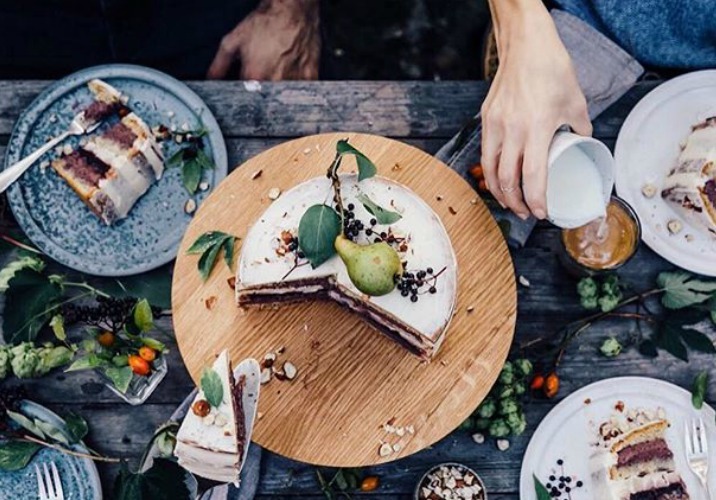 Use this guide as a base but as with all styling, there really are no rules – just go with what you, personally, like! I always start with a statement flower that I then build the bouquet around. In this case, I wanted to create a bright bouquet with spring colours and started with one of our new peach magnolia stems. I bent the stem so that the flower was resting on the neck of the vase and the leaf was twisted upwards to look tidier. If I was creating a permanent display, I would have cut the stem with wire-cutters to the desired length. Our faux eucalyptus spray is our best selling stem, as it is so easy to style on its own or as part of a bouquet. I started to add width to this bouquet by placing a eucalyptus stem on either side, bending the stems outwards rather than straight up. The beauty of working with faux flowers and stems is that they are so malleable and easy to bend and twist to your desired shape. 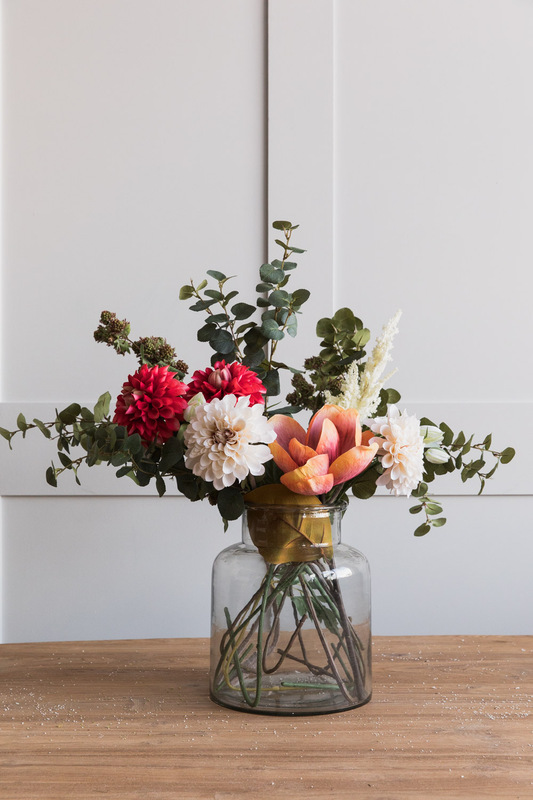 It’s tempting to just place a few flowers and eucalyptus in a vase and leave it as that, but your bouquet will look more interesting if you add smaller stems and flowers to pad it out. For this bouquet, I added a faux astilbe stem, a faux fritillaria and two faux raspberry sprays, bending the stems to the desired height and twisting them into place. 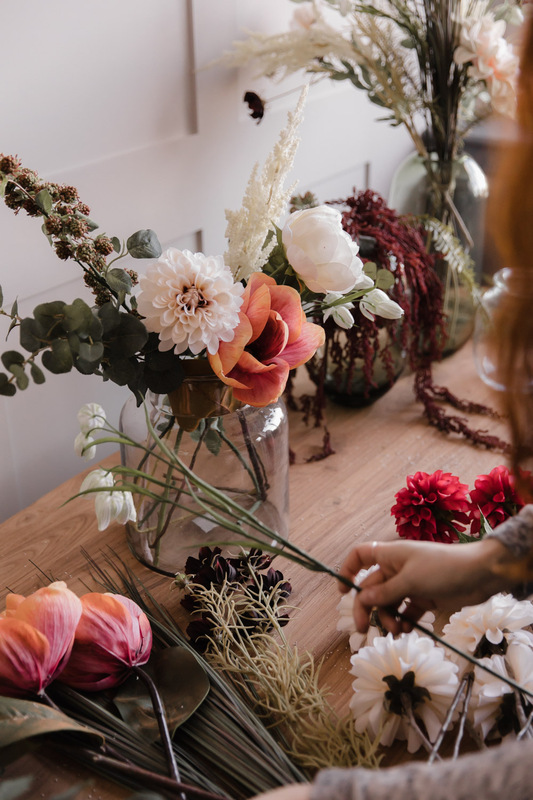 Don’t just twist the stems themselves, manipulate the individual flowers or leaves to create more movement in your arrangement. I originally placed a cream peony in this bouquet (see below) but stepped back and thought that it would look better with two cream dahlias instead. 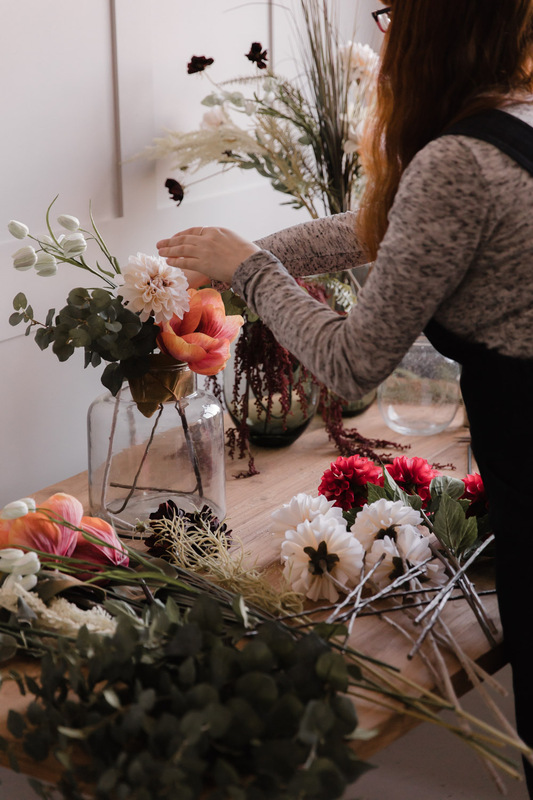 Don’t be afraid to change your mind and remove flowers as you go along and your bouquet evolves. My bouquet looked beautiful just with one pop of colour, but I wanted it to be brighter! I added two of our fuchsia dahlia stems for an extra burst of vibrant colour. Stepping back, something was still missing so I added one final eucalyptus spray to add height. Voila! Odd numbers usually work best. 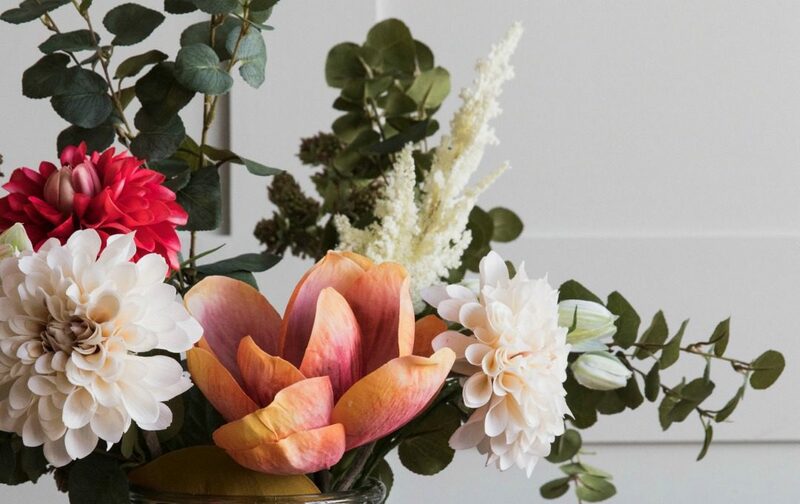 If you’re adding large or bright statement flowers to your bouquet, opt for 3 or 5. 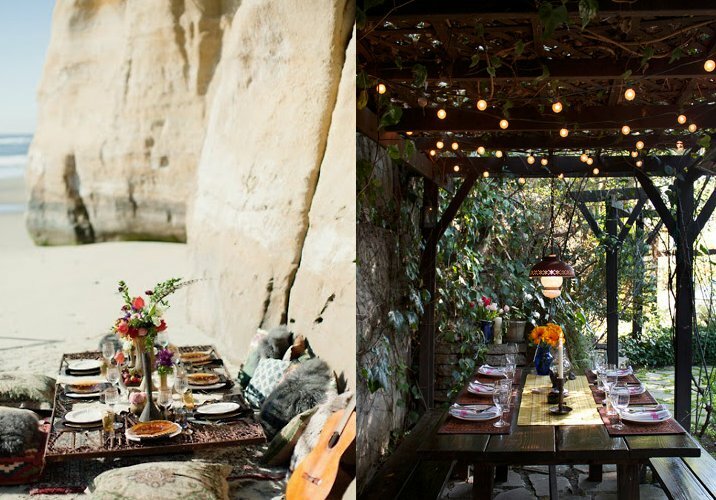 Eucalyptus looks beautiful with everything – you can’t go wrong with it! 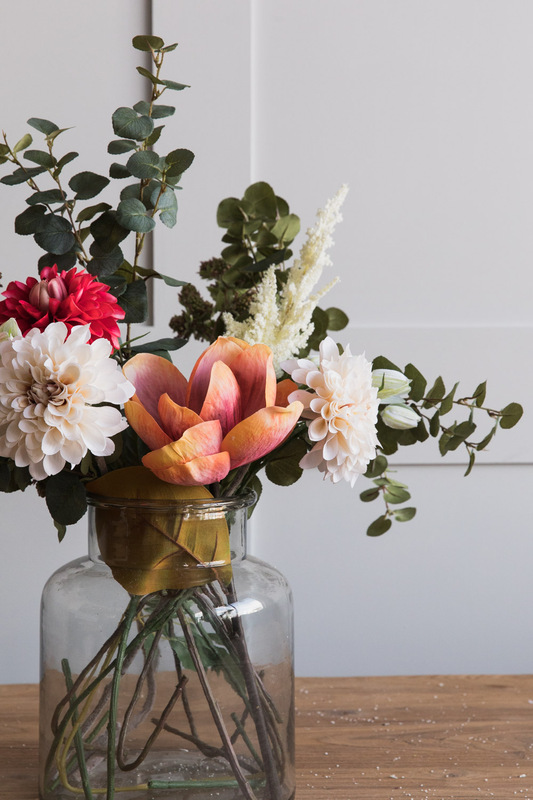 Go for mostly neutral colours and add a couple of complementary bright flowers if you want a more vibrant bouquet. 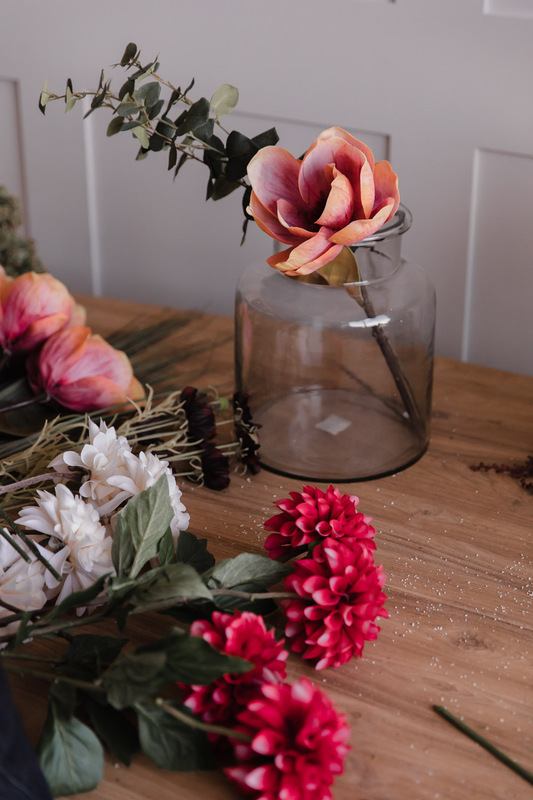 Add a couple of wispy stems, small wild-looking flowers or berries to make your bouquet more interesting. Don’t worry too much about the length of the stems – you can bend or cut them all to the right size. Ooooh very pretty! Do you know where the vase is from?